Chris Brown threatens Soulja Boy for talking about his daughter. In the past few days the beef between Chris Brown and Soulja boy been somewhat of a whirlwind. Today is off to just as bad of a start as Soulja Boy posted an Instagram video with Floyd Mayweather and continues to taunt the singer. 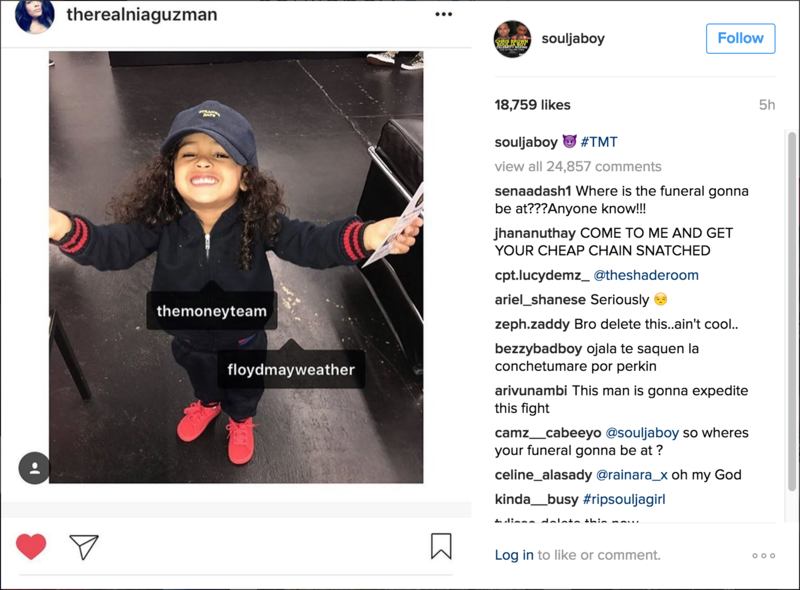 However, Soulja really crossed a line today when he re-posted a photo from Chris Brown's baby momma Nia Guzman that feature's the singer's daughter with TMT (The Money Team) and Floyd Mayweather tags. Though it appears that Soulja Boy has deleted the photo, the damage has been done and Chris Brown decided to share his frustration with the situation and give the rapper a few choice words in a new Instagram video. The one minute clip shows a very agitated Brown assuring that he will make the fight happen, while also simultaneously threatening the rapper to cease his exploitation of his daughter. Model and mother of Fetty Wap's child Masika Kalysha hopped on Twitter to side with Brown and express her disgust with Nia Guzman for putting the child in the middle of the feud. In the midst of all this, Nia Guzman posted to clear the air and express her neutralness in all of this. At the end of the day, this is just all one huge mess, but it seems as though there is any way to stop it from getting any bigger anytime soon.